Place cookies in food processor; cover. Process to form fine crumbs. Transfer to medium bowl. Add butter; mix well. Press firmly onto bottom of 13x9-inch dish. Refrigerate 10 minutes. Meanwhile, beat cream cheese, sugar and 2 Tablespoons milk in separate bowl with wire whisk until well blended. Stir in 1-1/4 cups of the whipped topping. Spread over crust. Pour 3-1/4 cups milk into large bowl. Add dry pudding mixes. Beat with wire whisk 2 minutes or until well blended. Spoon evenly over cream cheese layer. Let stand 5 minutes or until thickened. Spread remaining whipped topping over pudding layer. Refrigerate at least 4 hours. 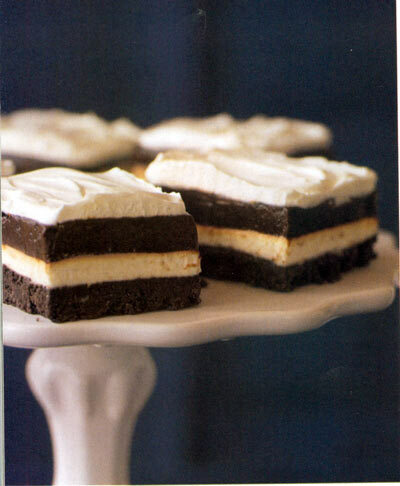 To make slicing easy, place dessert in freezer about 1 hour before cutting into squares to serve. Store leftover dessert in refrigerator.